Last week Drum Corps International announced two exciting new additions to the DCI family of competitive event brands. DrumLine Battle events providing drumming ensembles from across the globe, performing with less than 31 percussionists, with powerful opportunities to compete against each other in exciting new ways in a confined "battleground" environment. SoundSport® events showcasing instrumental ensembles of any instrumentation and any skill level year-round, spotlighting their unique talents and creativity like never before. We are pleased to answer some of the many questions we've received in more than 500 inquiries from enthusiastic potential participants who hail from 42 states and 17 foreign countries! What is the size of a SoundSport performance location? What is the size of a DrumLine Battle Zone? 12m x 12m with a 2m neutral zone. What are the competitive classes or divisions? There will be all-age and youth-only divisions. Sub-divisions may be determined once we start to see the composition of the groups desiring to compete. How long does a DrumLine Battle last? Routines for each group must be no less than 1.5 minutes nor more than 2 minutes. Live events feature two performance rounds for each team. Virtual battles online are one round only, and will be explained in greater detail in the weeks ahead. How will live DrumLine Battles be judged? Showmanship is the primary aspect of the battle, combining presentation and drumming expression. The objective is to "fire-up" the audience and out-battle your opponent! Are points awarded for technical merit? Technique and precision are important only as a tool to entertain the audience. What instruments are "legal" in DrumLine Battle competition? Instruments must be carried. Main instruments are battery percussion (snare, tenors, bass, cymbals), but participants may use other instruments only if carried. Who moderates the live DrumLine Battle events? The Battle Master will oversee the live events and will serve as master of ceremonies and announcer. How do judges choose the DrumLine Battle victor? Judges will huddle immediately following the battle. Winner will be announced immediately. There will be a minimum of three judges at every DrumLine Battle event. There will be one judge focused on presentation, one on drumming and at least one focused on judging the overall battle. Visit the DrumLine Battle website. 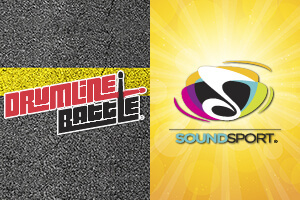 Visit DrumLine Battle on Facebook. Follow DrumLineBattle on Twitter (@DrumLineBattle). Follow SoundSport® on Twitter (@SoundSport).